Are you looking for a bright and colorful garden that is inviting to all your little winged friends? Have you considered starting a perennial hummingbird and butterfly garden? The giant Orange Trumpet Vine is a butterfly favorite boasting blooms that are double the size of other trumpet vines. Starting at the middle of summer into the last frost of the season you can watch the Rainbow Butterfly Bush draw in the little flyers from all around. Other plants that do well to draw in butterflies and hummingbirds are hardy lilies that will return year after year bigger and better than they were before. Purple coneflowers are a popular favorite in many perennial gardens and the butterflies just love them. A nice mass of Blazing Star Liatris with its purple stalks are sure to attract attention and a collection of Blue Columbine and Dwarf Daylilies could round out the collection for your flying friends. This little garden would bring a beautiful little haven to your garden. Ornamental grasses are well suited to most flower garden plans because they not only compliment other plants well, but they also tend to be very low maintenance plants. Ornamental grasses look equally great up against fences and structures, as they do out in the open. They come in a wide range of sizes and textures and can be put together to form just about any number of plant combinations. If you have a corner of your yard where you would like a lush green garden, this is one idea you can try. Start off with a large zebra grass plant in the corner. Zebra grass gets very tall and has variegated leaves that show off yellow bands. On either side of the zebra grass you could plant rose fountain grass that produces ribbon like leaves that flow outward and blooms with rose colored stalks. To add some color in the front you could try Daring Dilemma Daylilies that produce stunning burgundy blooms with rich pink edges. You can then edge the entire front of the garden with 5 or 6 Blue Festuca Grass plants that are short tufted plants that break up the greens of the other grasses nicely. What if you have part of your yard in the shade and you are struggling to come up with ideas that will thrive in that location? There are lots of great plants that do well in full to partial shade. One of the most obvious are hostas. Hostas bring rich textures and foliage to any location and some varieties like the elephant ears will produce large striking leaves that cover a lot of surface area. There are gold leaf varieties, blue leaf, and plenty of variegated varieties as well. If hostas are not your thing, no worries. Ferns are beautiful shade loving plants that make an excellent backdrop for any flower garden plans. There are ferns that grow just a couple feet tall, and ones that grow upwards of 6 feet tall. 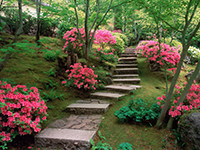 Place these in the back of your shade garden and work your way forward with some color. Perennial lilies will do very well in a shaded location as well and some varieties will get almost as tall as the ferns. You can pick up a few fernleaf bleeding heart plants that will produce delicate little flowers. You can edge the front with lily of the valley plants that will produce a nice ground cover with little white flowers when in bloom. 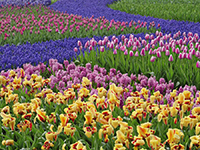 If you enjoy having fresh cut flowers in your home from spring through fall, there are some great flowers out there that you can put together in flower garden plans to not only bring vibrant colors to your yard, but also into your home as well. Cut flowers are expensive these days and they don't last as long as we would always like. Wouldn't it be great if you had a cut flower garden in your own back yard so you could just walk out there and pick what you wanted? Start off with a centerpiece of hardy gladiolus that grow tall and straight with many colors to choose from. Surround these with a collection of mixed hardy carnations, because every cut flower display needs carnations. Add a few mixed liatris around the carnations and that will give you a nice start with some tall flowers in the center. 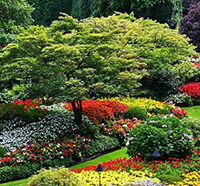 Then you can start working your way around the garden planting various shorter plants such as delphiniums, various varieties of mums, asters, bellflowers, Canterbury bells, and several daisy varieties. 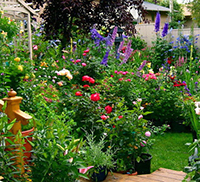 The result the following year will be a cut flower garden that you will not believe. 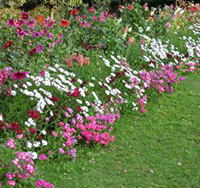 Perhaps you would like flower garden plans that are not only beautiful but water conscious as well. You are not alone, these days many of us live in drought prone areas and sometimes we just cannot dedicate as much water as we would like to our gardens. You need not worry though as there are plenty of great plants out there that you can use. You don't have to settle for a cactus garden just because you want to save on the amount of water you have to use. Start off with a backdrop of maximillian sunflowers. These will get nice and tall and offset the other plants. In front of that try some sweet vanilla butterfly flowers and some blue sea hollies. At either end you will find cotton candy grasses and purple coneflowers will work nicely. Then in the front to add some more vibrant colors, use some fiesta daises and golden sedum. You will find that this combination of plants will not only add great color and texture to just about any location, but they are all pretty drought tolerant as well, making these flower garden plans easy to care for!